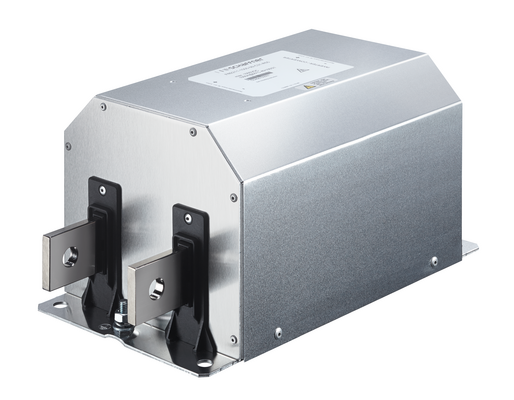 Schaffner introduces the new FN 22xx HV and FN 33xx HV standard filters for high current applications for 690 VAC and 1.500 VDC PV inverters, converters and motor drives. The filters are optimized for the requirements of photovoltaic-, power conversion-, energy storage- and motor control systems. Along with appropriately sized 690 VAC EMC/EMI filters FN 331x HV on the line side, the new FN 221x HV DC filters help to meet the limits of binding EMC standards for PV installations in Europe and other regions. Further, the 1’500 VDC filter FN 221x HV will help to increase the service life of the solar panel, improve its reliability, and reduce potential interference radiations of the panel, by keeping away the inverter-born high-frequency and leakage currents. FDIS recently approved the new international CISPR11, Ed.6.0 standard, which defines now the conducted emission limits at the DC power ports of "Grid Connected Power Conditioners". The extremely compact AC filters FN 331x help to meet the already well known EMC standards and are optimized to suit the most modern inverter design requirements of various power converter types. The new filters will require much less installation space compared to traditional solutions, due to the optimized attenuation performance levels. They also offer minimum power loss related to the rating of the inverter and thus help to maximize the system efficiency. Both bus-bar filter series are available with ratings from 250 A to 2.300 A. Versions without capacitors to ground are also available as standard product for specific AC- and DC power system requirements. All models are CE, UL, CSA and ENEC (FN 331x HV) approved and RoHS compliant.